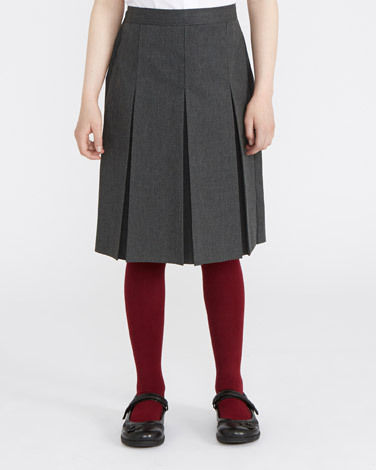 Neat and simple, this box pleat skirt is a uniform essential that is designed to keep girls looking their best throughout the school day. Featuring permanent pleat technology, this knee length skirt has an adjustable waist for extra comfort while our complete stain control repels water and oil to ensure her uniform is looking fresh. Machine washable for added ease, stain release helps to lift even stubborn marks and crease-resistant fabric means that the skirt stays crisp with minimal effort. A comfortable and confident school essential.